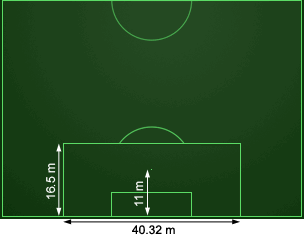 The size of a football (soccer) field is about 100 metres long and 60 metres wide, but in official games there are regulations about the minimum and maximum dimension. In the world football the most official dimensions are those that had been decied by FIFA (The Fédération Internationale de Football Association). The length (touch line) has to be minimum 90 metres (100 yds) and maximum 120 metres (130 yds). The width (goal line) has to be minimum 45 metres (50 yds) and maximum 90 metres (100 yds). The length has to be minimum 100 metres and maximum 110 metres. The width has to be minimum 64 metres and maximum 75 metres. 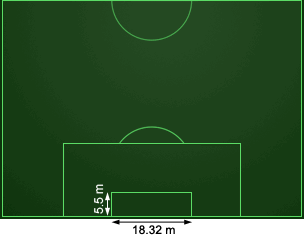 The goal area is the small box inside the penalty area. The FIFA rules stipulates that the distance from each goalpost to the lines the goes parallel to the touch line should be 5.5 metres. When the size of a standard goal is added it makes the distance between the lines 18.32 metres. 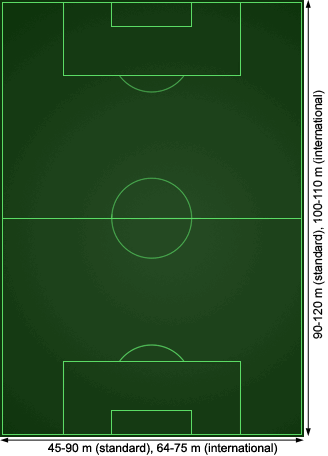 The penalty area is the bigger box close to the goal that integrates the goal area and the penalty mark. The lines that extend into the fields are 16.5 metres and they have a 40.32 metres distance from each other. The penalty mark is 11 metres from the goal line and centered on the fields' goal line.